Food Wishes Video Recipes: Chocolate Lava Cake – Is this the World’s most delicious mistake? Chocolate Lava Cake – Is this the World’s most delicious mistake? Legend has it that this dessert was the result of a major catering disaster. The dessert for this particular event was to be individual chocolate cakes, but someone took them out of the ovens to soon and the centers where not cooked enough and still liquefied. Well, there was no time to take them off the plates and cook them more, so the Chef simply had his wait staff introduce the dessert as Chocolate “Lava” Cake! Brilliant! Now, whether this is true or not, I don’t know for sure, but it totally sounds like something a Chef would do. If you have a better story email it to me and I’ll start using it. Regardless of how it was born, it sure is good. I used very dark chocolate, but you can use semi-sweet or milk chocolate if you prefer. If you’ve watch my clips regularly you know I’m not big on measuring ingredients, BUT when you’re doing baked desserts you really do need to be accurate. So measure carefully. By the way, this was a view request and the photo he sent me (pictured above with the fruit) had no copyright info with it. I did use it in the clip and hopefully no one gets too upset. If you did happen to take this photo, and are upset I’m using it without permission, please email me and I will credit you. Enjoy! Welcome new visitors! Click here for the home page and over 200 more video recipes. *Bake at 425 F, in water bath for 15 mins. Thank you! Did you get your "foam shirt yet?" Mmmmm. Who can resist chocolate? This sure would make a yummy dessert for a group of gals getting together to celebrate someone's 38th birthday this weekend! This looks so tempting! But I have a problem though since UK measurement doesn't go by tbl...can I have it in grams please? I was told that you used my photo in your blog and the above is my recipe too. I don't mind you using it but at least ask for my permission. Good Recipe, I've included a link from my blog. Also, did you read the last paragraph of my post? I actually joked about using the photo without knowing where it came from. Anyway, sincerest apologies! you said cream the eggs and the sugar, but thats the foaming method! preposterous!!! Who are you? your comment is preposterous! I demand you defend yourself. I'm no baker, but I think you may be crazy. This is anne from the philippines. It's a good recipe very easy to follow,is it ok to add raspberry in it, and some grand marnier to give a little unique flavor? Also I would like to ask for some sugar free recipes if you have some.Thanks. yes, those flavors would works great. Sorry, no sugar free recipes. I just made this yesterday, converted the measurements for europe, and it came out amazing, even in my dinky toaster oven. I think it works best with dark chocolate, and a scoop of vanilla ice cream. You think its possible to add a drop or 2 of peppermint flavor to make a death by chocolate mint cake? yes, the mint will work! I just used hot tap water. I'm not sure of your problem. I'd watch the clip again to make sure you didnt miss a step. did u chill them? is your oven accurate? most arent. did you let them sit for 15 minues? (they continue to cook? Did you use good baking chocolate? Are your ramekins small like mine? I think the recipe is OK because of the comments and emails that said how good it came. watch and try again! 2- since they have to be completely chilled before baking, it means they can stay in the refrigerator for as long as I want, right? anything happens if they stay in there for too long? Ah nevermind about the extra large eggs......just found out I can get them. you can leave them in the fridge as long as you want. And, the ramekins have to be for baking, and oven safe, which almost all of them are, but check when you buy them that they are made for cooking. good luck! ok i have some ramekins, they should be alright. so you say it's ok if they go straight into the oven? how do they not explode? they wont if they are "oven-proof," if they aren't no promises. I have no way of knowing for sure. they should be labeled oven proof. I made it!! They were a little too molten though, even in the outside. I did follow your instructions step by step! Maybe my oven is different or something. Think I should let it bake for a couple more minutes? 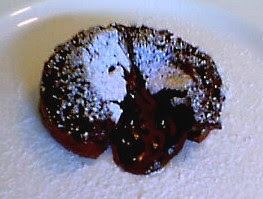 Chef John: your chocolate lava cake saved my Christmas party when my first attempt became a disaster. It was easy to make and the essential "wow" factor came through. What made the difference was your video showing the extra steps that people forget to write down in a recipe. Thank you! just tried your recipe this evening to the tee but the batter didnt cook, so i was left with chocolate pudding :) any suggestions as to what went wrong? oven was at 220C. it very hard to say. The only reason it didnt cook would have been the oven not fully preheated, or your oven is not calibrated and was not as hot as you thought. I know it works, as I and many have tried it with great results. BTW, even though times are given you have to look and feel them before removing. They would have eventually cooked more if leaft in. I would get a oven thermometer and check to see if you oven is OK first. Good luck! it should work OK, texture may be slightly off due to different cocoa percentage. BTW this is pretty sweet even when semisweet is used. The bottom was not crispy like the top was. Any suggestions? What if I put less water or what about no water at all? or no bottom dish at all? What does the water do anyways? Chef John, did you let them cool outside the water on a rack, or inside the water? the bottom doesnt get crispy. it just cooks like cake. The waters density transfers the heat more evenly around the cakes. Ok, I thought yours looked crispy on top (or what was formerly the bottom) when you put the fork through it. This sounds like a great recipe, I will probably try it after Lent, perhaps even for easter Sunday or something. However, sadly the video isn't working anymore. What happened to it? Is it still available somewhere else? i want to make this for my girlfriend, but unfortunately being in a college dorm these materials are hard to come by. i have a muffin pan, would there be a way to cook them in a muffin pan without the water pan? not sure what would happen. the water is important... better do a test batch! What's the yield for the Chocolate Lava Cake recipe? chef john, I don't have any ramekins so I was wondering, can I use small glass bowl? will it crack? Was wondering for the flour, can i use normal plain flour?? What if i dont have any chocolate bars like what is used in your recipe? Would it be possible to use hersheys liquid chocolate syrup in its place? Just curious. is it possible to re-heat the cakes after they are left for to long?? i've never tried, probably not a great idea. Do you have to bake them in those dishes or can you bake them in a regular cake pan? they dont really rise, only a bit. dear chef john i have heard of something called chocolate fondant no not the kind you put on cakes the on where it is actually the cake. BTW are muffin tins ok for chocolate lava cake? sorry, never done fondant... Metal and glass don't conduct heat the same, so it may not work as well, but give it a try! thanks for the advice ur an awesome cook! not sure about chips, maybe there is a conversion online, do a search. I've only used the small 5oz size. I'm not sure of the cooking time for large ones like that. You may need to experiment. exuse me, but how long do you keep it in the refrigerator??? I'm making them now and using semisweet chocolate chips. The bag was a 12 oz bag, so I used a bit more than one fourth of the bag, which came out to be a little more than half a cup of chips. Let me know, I've never used the chips before. I'm not CasualSax, but I made the lava cake with semisweet choc chips 2 days ago. They turned out great. I may try butterscotch chips next. I had this a few times on a cruise....MMMMMM!!! So good! They called theirs "Warm Chocolate Melting Cake"! I only have medium size eggs, will those work also? Do I need to add another egg, since I don't have the extra large?? Thanks! try adding an extra yolk. That should be close. Also, do you know the approximate serving size for this recipe? Hi Chef John, this looks awesome! i wanna make this for my bf's birthday, but is it possible to vary the size and no. of cakes to just one medium sized cake? Thanks! this recipe is only for the small ones. It wont work the same as a larger size. Thanks. What do you mean by cake flour? Is it the normal plain flour or self-raising flour? Regular flour will work. Not self-rising though. Cake flour is also sold as "Pastry Flour" and has less gluten. can i bake using microwave oven? I've tried your recipe today, it wasn't even close to what i've expected. It was abit too hard and the inside is not lava-y at all, I would like to find out what went wrong? Did i overcook it in my oven? Is there any other reason other than that? yes overcooked. was it chilled? Anyway, the bf and I have a major sweet tooth and this is one of our favorite desserts to get when we're out. Glad to know it's so simple to make! Or at least you make it seem simple! IMHO, this is not the right way to make a lava cake. The best way is to use the recipe in the famous "Better Homes & Gardens New Cookbook" which basically involves making a cake batter, and then melting some semi-sweet chocolate with a little bit of heavy cream (in Canada it's sold as "whipping cream" even though it's not whipped yet). This melted semi-sweet chocolate is cooled and then rolled into 6 balls. You put 2/3 of the batter into the ramekins, then you put a chocolate ball into the center of each. Then top off with the remaining 1/3 of the batter. It came out perfectly and we were so confident even before baking it that it would work that I brought it to a friend's house that night. With John's recipe even after doing 2 test runs at home I'm still not confident enough to serve it to others. I have tried ChefJohn's recipe 2 times (and each time I did cooked some of the ramekins with different parameters than the others) and I could never get it quite right. Even when I did it right (and the inside was perfectly liquid) the outside didn't have a nice texture to it. I'm not sure why I had trouble with it, but I think it's because there is so little flour in John's recipe. The Better Homes and Gardens recipe has 1/3 cups of flour, but concentrated in the outer mixture, however, it makes 6 cakes, not 4. Or it could be because with my recipe you can cook it longer to get the outside nicely done, and it won't affect the inside. The inside will always be gooey. Thanks for your comment. There are always hundreds of right ways to make something. I have made successfully many times, so I'm not sure what your major malfunction is. is the sugar caster sugar or normal coarse sugar? check out this recipe from my American Food site. Thanks chef john!!!! I will try it out and come back to u if i have problems ok?? what if i can't get the mix?? any recipes from scratch??? You can, but I don't have a homemade one posted. There are so many online though. Just search for "Chocolate fudge cake"
Can l bake it immediately after taking out from refrigerator? Hi, can l put it into the oven immedicately after taking out from refrigerator? Does it need to rest awhile? i baked according 2 ur instructions but the top layer was hard. what went wrong? sorry, but impossible for me to say unless I watched you do it. Maybe the oven temp is off. Many ovens temp gauges are not accurate. Was the inside soft? The top is supposed to be firm. maybe it's the temp. the 2nd time i baked it the top layer was hard but the bottom part wasnt cooked. does the volume of water affects the bottom part of the cake? cause i put more water in the water bath and the bottom layer wasnt cooked whereas the 1st time i tried it with small amount of water it was cooked. It tasted great! It is my first time actualy cooking something if you know what I mean. I used Reeses cups rather than the chocolate, it turned out good exept I didn't use enough butter to lubricate the metal cups I cooked them in; so the lava cakes didn't come out that easy and the tops of 2 of them broke, causing the Reeses mix to poor out. OMG OMG!!!!! your chocolate lava cake is so delicious!!! i loved it! Hope you can come up with more fantastic recipes!!!! Cheers! the cake is really delicious. i hope you can coe up with more and more fantastic recipes! Heyy , can i use an oven for melting the chocolate and the butter ? better to put a bowl over hot water. what kind of material should i use to put in the oven to bake for a long period of time ? i'm afraid that it would explode . any oven-proof ceramic ramekins. it will say on the bottom. I've viewed the video for a few times and decided to try it today. But the mixture i had was very watery. I would like to ask you a few question, i hope you'll be able to help me. First, i didnt use the extra large eggs as in your recipe, i just use a normal sized egg,is this wrong? Second, i couldnt find dark chocolate in the supermarkets, so i used milk chocolate,is this also wrong? And how long should i melt the butter and the chocolate in the oven? Because when i take the melted butter and the chocolate out, it was already very watery. I'll really appreciate your help. Much thanks. milk chocolate is a different composition and will not work. Also, i haven't used less egg so I don't know how much it will effect it. i would add another yolk. i just tried the recipe for the second time and failed i swer i did all measurement on the website.creamed egg, all that stuff. i even heated the water for the bath and only the top part was cooked.unless it mattered that i used un sweeted baker chocolate? or that my oven is electric? oven doesn't matter, unless the temp is off, which many are. You can check with a thermometer. You must use the same chocolate I did, or I'm not sure what will happen. I'm sure that is it since many have made this successfully. THIS IS DARN GOOD!!!! but it's just that it didn't look the way it was suppose to be, so, what type of cocoa powder and dark chocolate did you use? Hershys? i don't remember. The chocolate bar was Varona I believe. It's crucial to use the top grade dark chocolate and unsweetened cocoa. just wondering i have made my batter and put it in aluminium foil cups inside the fridge for chilling already. will the foil cups affected the heating process instead of using ceramic cups like you did? Hi chef john, just wanted to ask about the water bath. After we have chilled the cakes in the refrigerator, do we place it in room temperature water for the water bath then put it in the oven for 15 minutes or do we have to heat the water up in the oven at 435 F before placing the cakes in it? Cause i dun get where the baking occurs, in the water bath? 1) for the eggs, can i put 2 medium size eggs and 2 medium size yolks? 2)can i use a microwave oven and set it to a particular setting if i do not have a baking oven? needs to be served after baking. Make gingerbread, recipe on site. hi, is it possible to use aluminium containers besides porcelain?? I've never tried. They are much thinner and may not work. I have just tried to make this chocolate cake but failed! I really don't know what went wrong as i measured all the ingredients (in grms) correctly. One thing is that even after i mix the flour and cocoa powder into the batter, it remained watery! I saw the video and yours was thick and almost like a dough, mine was just watery. i baked it and the batter was still watery after 15mins. do you have any idea what went wrong? i would like to bake my own chocolate lava cake badly if you can help.i would appreciate it alot. Must have been the measurements, maybe your metric conversions were off? It's probably the metric conversion,because you used 3 tablespoons of both the flour and sugar in your original recipe (around 45 ml or grams),and in your recipe in metric measurements you used only 20 grams of flour.That's probably a mistake that would make the batter watery. Btw.thanks a lot for your wonderful recipes,I already made your spicy "Clifton Springs" chicken wings,El Paso pizza and some other delicious things from your site,now i'm trying to make this little beauty. Can I use semi-sweet chocolate chips for the chocolate? yes, as long as the weight is the same. I've only used ceramic, so I cant say. Those others would not cook the same though. 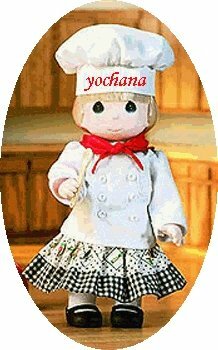 I would like to prepare the cake mixture the night before, and cook them the next day. Is it ok to leave the precooked mixture in the fridge overnight? I know baking requires accurate measurements; however, what if i wanted to add more chocolate? it would simply make it a thicker, heavier cake, right? also, i have 4 ounce cupcake tins. will those work? my local supermarket does not have ramekins. I'm not sure...only one way to find out! can i use microwave to bake it? it came out great. Even though i used aluminum cupcake pans. Oh my gosh this was my first time baking but it came out AWESOME. I used a muffin pan instead of ramekins (and just put it in a bigger baking pan with the water). The only problem with this strategy is that then it's really hard to get them out--I flipped the pan and they sort of plopped out one by one and it was hard to control where they fell. One lost its guts to the procedure but the rest survived. i jus wanted to know abt the role of flour in it..i've checked some recipes in which flour wasnt included..n m sort of confused..
tell me the difference in lava cake-2? i changed the eggs to large to make it easier to shop for. Not sure about the flour, a little helps the crust i believe. well i tried ur recipe..it didnt came out rite..sort of baseless..lolx..but the taste was great..
what if v dont put water on the base..it may help creating a nice base then? another quest. while making baking chocolate brownie..after melting butter n choclate..we hav to add eggs n every thing rite...my quest is..what shud b the temp of choc.n butter when v add other stffs..totally room temp.or slightly hot.\? Hello Mr chef from Denmark. Im sooo glad i found you :) Nice food your making. I just wanna know, is it posible to warm this cake in the microwave, if youre not gonna serve it right away? It is in danish - but you can always look at the pictures. I have the best hommus in the world on my blog, and its without oil. BTW - Iwe seen your cookies recipes, but do you have another great cookie recipe? Maybe chocolatechip cookies that not are to flat? Or muffins? Must the water in the water bath be cold/hot/warm/just room temperature? Chef John, your video said you've revised the ingredients (not listing "extra large" eggs, for example), but I can't find them. Can you give me a link to the newer recipe, please. Many thanks! 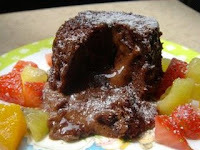 Not one of the better molten cake recipes I've tried (and I've tried a lot). This one is too "heavy" and the amount of flour and cocoa powder are probably the cause. It's also one of the few recipes using a water bath (adding an extra, unnecessary step to make a tasty molten cake). can this be done with regular butter? i cant find unsalted here in argentina. and i dont have cocoa powder, i have pure cocoa chocolate with all 100 % cocoa without sugar (its just a brown super pure cocoa bar). could i grate that into a powder instead? butter yes, but you can't make your own cocoa powder. Thanks! The recipe calls for 3 tbl of sugar, is that 3 table spoons? when i watched you video I got confused when i saw you add the sugar cause it looks like alot more than 3 Tbl spoons of sugar. Also; is 3 table spoons of flour and 2 tea spoons of cocoa power correct? Thanks. Hi i don't have a microwave only oven, issit possible to melt chocolate and butter in the oven? If it is, for how long? Many thanks! I see you've been replying to this post for a good few years! Anyway thank you for the informative video, look forward to this for dinner later! hai, chef.. i only have a conventional oven on my house.. so i wanna ask you, should i use only the above fire or only the bottom fire, or should i just use both fire to bake the choco lava? I only have a conventional oven too, so I'm confused what you mean. Ovens don't have top/bottom heat, usually just bottom. Smoked Salmon “Gravlox” Part 2 – It worked! A Real "Slip of the Tongue!" Tarragon Aioli – Keeping it real! Hollandaise 101 – Can a sauce really sense fear?